Marko Mikkilä has opened a gallery for his halo photos. Shown are the best diamond dust displays from the nearby Louekallio ski resort snow machines. The gallery is still under construction, so keep checking. The image here is from one of the Mikkilä's displays. It's caused by headlights of nearing car. This is actually stacked image from nine individual unsharp masked photos. 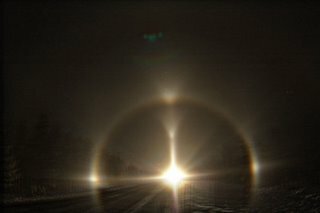 The stacking program, Registax, was told to align the photos using the right parhelion. Above the car lights, there are two V-shaped arcs. The upper one is the common 22° upper tangent arc (perhaps with upper sunvex Parry arc), the lower one is Moilanen arc. Nice photos and web site too! Wow Awesome photos I want some of those halos in USA.